I got an e-mail from an author/illustrator colleague who is about to do her first school visit—she asked for some tips about how to make it a success. Here are a few ideas that came to mind. First of all, don’t be nervous. The students are going to treat you like a rock star. You’ll be new and different and fun. They’ll love you. Dress like you’re going on an interview. Have you read the story aloud yet? Rehearse before you go in front of the students. Read it to a friend or two this weekend, just so you can get comfortable with doing that. BE AN ACTOR—be sure every character sounds different from the others. Don’t be afraid to go over the top with the voices. I’m a ham, and wear some kind of hat that fits with the story—a cowboy hat, or bunny ears—because the narrator is also a character. Relax, don’t rush through your reading, and enjoy the experience. Ask for water. Ask for a microphone if you’re speaking to an assembly. If it’s just 25 or so kids, no mic. Know how much time you’re allotted and keep an eye on the clock. I have a few of my books in jpeg format. The school should have a computer and projector—ask for it ahead of time, along with a tech person. You bring your jpeg file on a flash drive. Bring at least one backup on a different flash drive. You can project your images while you read the story. If you feel comfortable doing it, draw the kids a picture afterward. An easel with a big pad and a chisel-point marker is all you need. Keep it simple. Draw something you’re good at drawing—a cat or a dog. Describe what you’re drawing as you draw it as if you were doing a presentation on the radio. When the show’s over, thank everyone and turn the class back over to the teacher. Another fantastic and fun project for the Pittsburgh Public Theater—create an image for A Funny Thing Happened On The Way To The Forum! My talented pal Paul Schifino art directed. He asked for something with a cornucopia and spectacularly oomphy slave-girls. I generated a bunch of rough ideas—we lost the cornucopia along the way. Harem pants looked too ‘I Dream of Jeanie’, so they got replaced with skimpy versions of ancient Roman fashion. Not a job for the faint-hearted. A side note: this 2017/2018 season will be the finale for Ted Pappas, the Public’s Producing Artistic Director. I’m grateful to have seen many of his fabulous productions over the years. Best wishes for a well-deserved retirement! Once again I had the honor of creating an image for Pittsburgh Public Theater‘s season brochure. 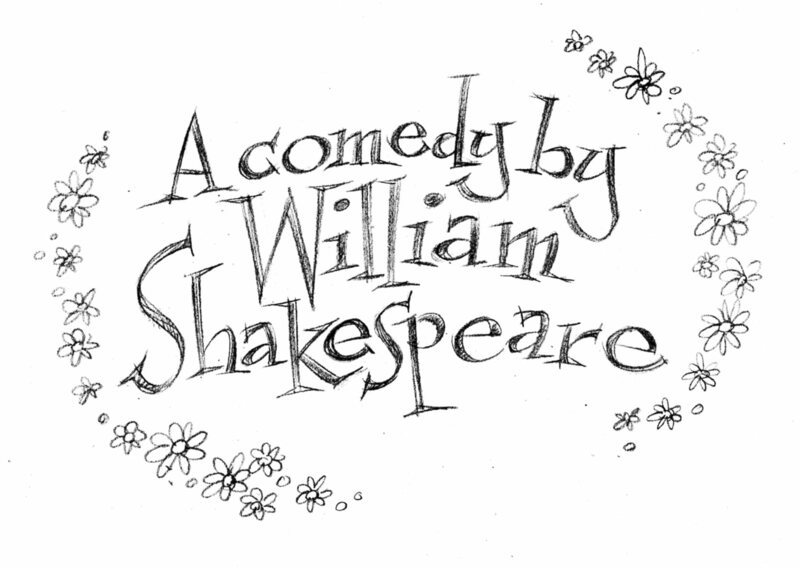 For Shakespeare’s Twelfth Night, designer Paul Schifino asked me to focus first on the title lettering rather than images from the play. I generated a bunch of rough sketches, first fooling around with different lettering styles. We added elements of the story to the type, like a pair of yellow stockings and roses. One character sends another a forged love-note and I used that motif in one of the treatments. The client picked out two favorites and I drew two tight sketches based on those. I created separate components for the winning image: lettering was done in ink on a light box and the notepaper and roses were painted as another piece. You can find the entire 2016/2017 season brochure here. Twelfth Night is on pages 8/9. One character wears outlandish yellow stockings to proclaim his love. Client likes it but too hard to read. In the play, a forged love-note is sent. I thought that would be a great motif for the title type. Just the paper and roses. This past January I had the pleasure of creating images for the Pittsburgh Public Theater‘s season brochure—this time for the world premiere of L’Hôtel, a new comedy by Ed Dixon. The cast of characters is 6 stars from the recent and distant past. Art Director Paul Schifino asked me to create stand-alone caricatures of 3 of them: Jim Morrison, Oscar Wilde and Sarah Bernhardt. Here are sketches, painting-in-progress and the finished art of the Divine Sarah. By the way, this painting and two others will be on display at the Art Institute of Pittsburgh Alumni Show which opens this Friday evening. 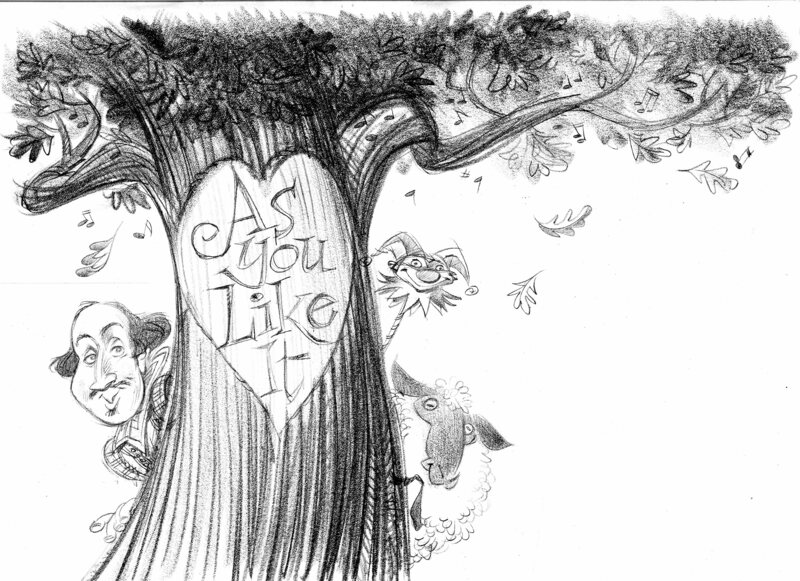 Paul Schifino hired me to create an image for the Shakespeare comedy As You Like It—to be part of the Pittsburgh Public Theater‘s season brochure. 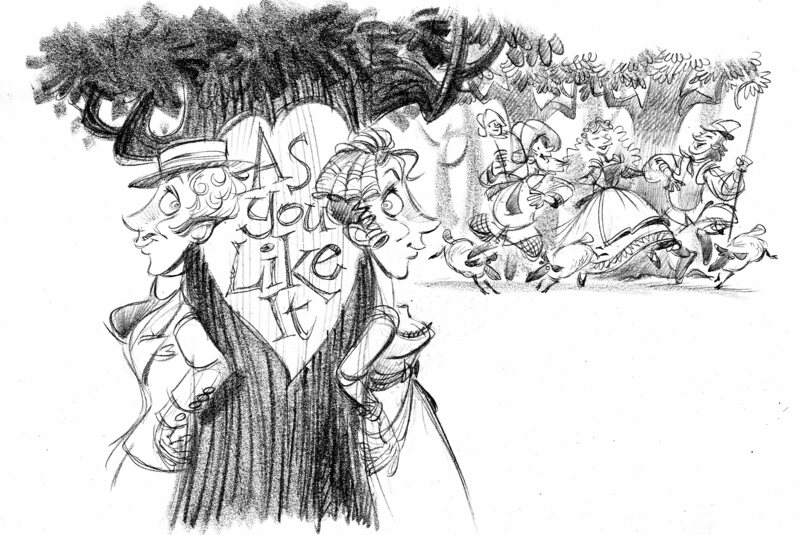 Much of the play takes place in the woods; the main character, Rosalind, disguises herself as a man; there is a jester, shepherds, nobles, peasants; romantic intrigue; a wrestling contest; kissing practice; sheep; a punched lion and a wounded deer. I worked all this stuff into one rough sketch—I like the look of chaotic fun with a forward motion. The director—Ted Pappas—plans to stage it all in Victorian costume. This one doesn’t quite work—Rosalind needs to be the focus. The client felt she blends into the crowd and it isn’t clear she’s a girl disguised as a man. 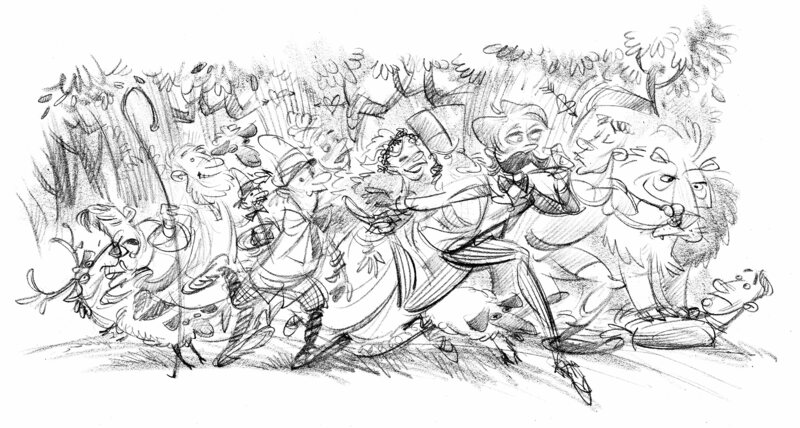 Could I instead push the crowd into the background and bring Rosalind forward? 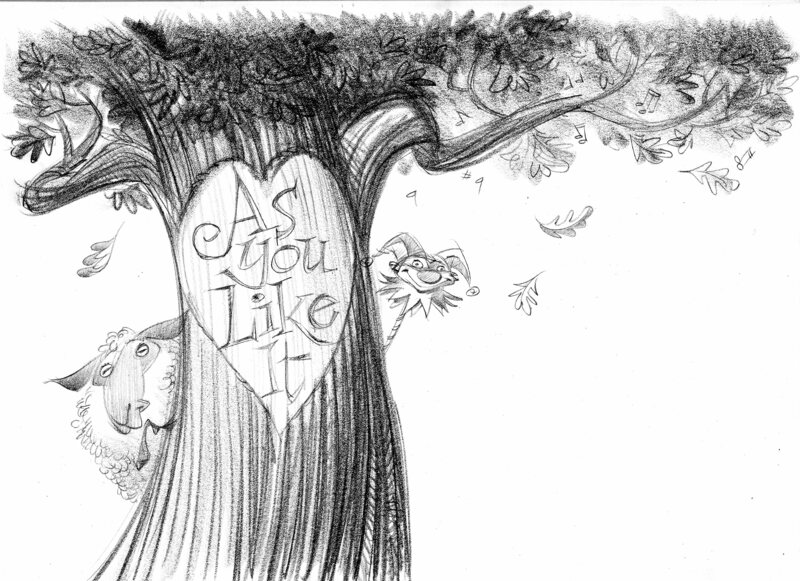 How about a tree, and Rosalind is on one side as herself and on the other side dressed as a man? How about a shepherd and some sheep in the background? So in the play one of the characters (Orlando, I think) carves love poems into the trees. I used that device to incorporate the title lettering. The client loved that, but not the 2 Rosalinds. Lose them, keep the tree, lose the peasants, put a sheep on one side of the tree and a jester’s stick on the other. And put some musical notes in with the leaves. Okay, better—but could we include William Shakespeare? Nope, that’s too much. Shakespeare looks cartoony. Let’s go back to the previous sketch. Also we’ll need to see his name hand-lettered. Too mach banner over ‘kespeare.’ Make it 2 banners. This will be a separate piece of art that gets placed over the tree-trunk.